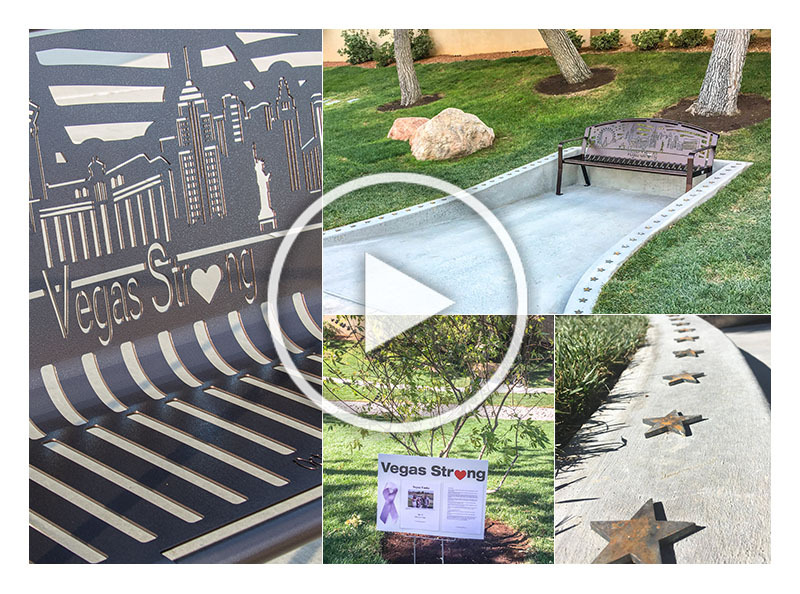 Peccole Ranch, a community in Las Vegas, ordered a special bench for their memorial park. The memorial park is a place to honor the victims that were killed on October 1, 2017, along with the nurses and doctors, first responders, and all those who put themselves in harms way. There were many heroes ,that night, who put their lives on the line to save others and showed that humanity shines through, even in the darkest of moments. You can read the press release here. At Smith Steelworks, we were so humbled to work on this project and have been amazed at how the city has banded together. 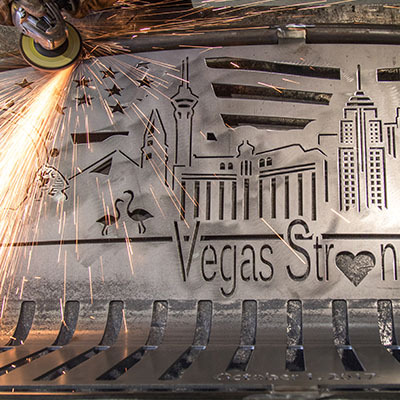 Keep scrolling to learn more about the memorial bench process and how we can all be Vegas Strong. 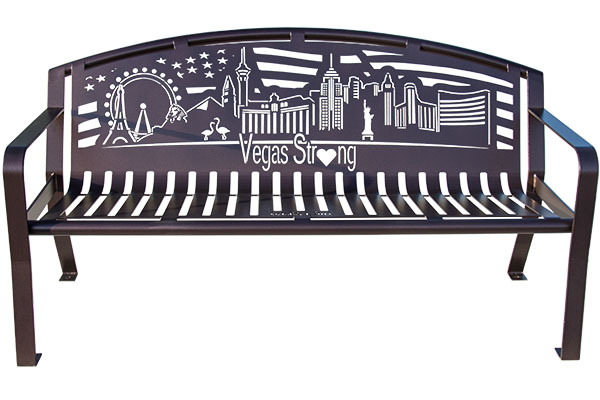 Our design team took a lot of time and consideration into planning the Vegas Strong Bench. We even opened it up to Facebook and let you decide which design concept you liked better, along with additional suggestions that made the design what it is today. The American Flag was added for a few reasons. Although the tragedy happened in Vegas, the whole country is rallying behind the city of Las Vegas in support. There were also victims of the tragedy that lived all over the United States; showing that this has affected the entire nation. 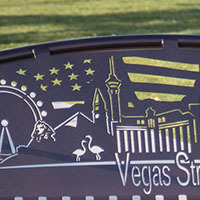 It was important to show the Vegas skyline clearly across the bench. This shows that although there has been tragedy, Vegas stands tall. The skyline features some of Las Vegas Strip’s most iconic landmarks including: The High Roller, New York New York, The Luxor, Stratosphere, etc. Once the design was finalized, the bench was sent to be laser cut. 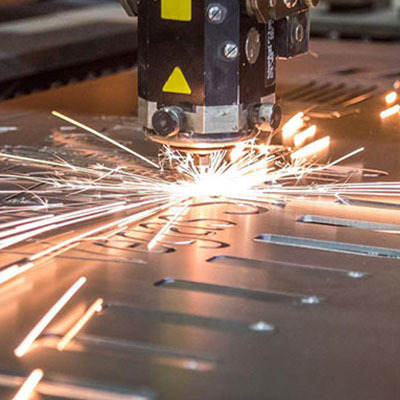 The laser uses precision cuts that allows our designers to work with intricate detailing. 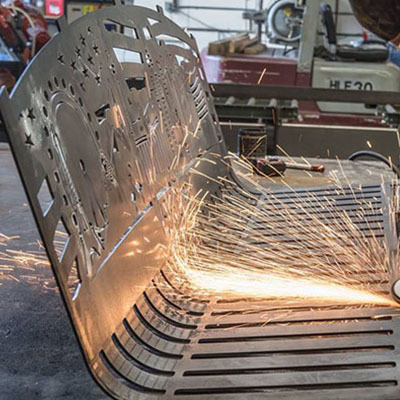 The body of the memorial bench is cut from a single sheet of metal. It is then bent into shape; allowing for fewer welds and yielding a stronger memorial bench. Legs and arms are welded to the bench. Each weld is fully closed to prevent moisture from being trapped. The welds are also smoothed down for a flat surface. The memorial park and bench were dedicated November 4th, 2017 in Peccole Ranch. Cast into the concrete is a star for every victim that died from that terrible tragedy. Our team was humbled as we cut out each and every star and thought about those sweet lives that were taken too soon. We cut out the heart from ‘strong’ and duplicated it to make six hearts total; one for each victim from Peccole Ranch. These hearts were given to their families and a way to have a piece of the bench with them. Six trees were also planted to represent the six members of the Peccole community that died. A seventh tree was also planted to represent everyone else that passed during the tragedy. 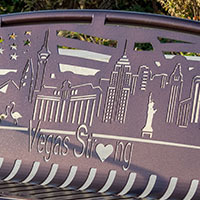 We have received many messages about purchasing additional benches for homes, cities, garden spaces, etc. Please give Russel Smith a call at (801) 414-1724 or send an email to russelhsmith@gmail.com.